This roller coaster season for the Alabama men's basketball team continues on Saturday when they travel to Gainesville to face the Florida Gators. Alabama enters the game 5-4 in league play, while Florida enters with a 6-3 record. Both teams will seek to avoid back-to-back losses after poor mid-week performances. Game time is 3 P.M. CT. ESPN will handle the television duties. Hit the links for team and KenPom stats. The SEC has been a meat grinder this season. Nine of the fourteen teams have five or mores losses in conference play, with the second half to go. Six teams are currently 4-5 in league play. What once looked like a league that could send as many as eight teams to the NCAA tournament is now hoping that the middle of the conference doesn't cannibalize itself before Selection Sunday. 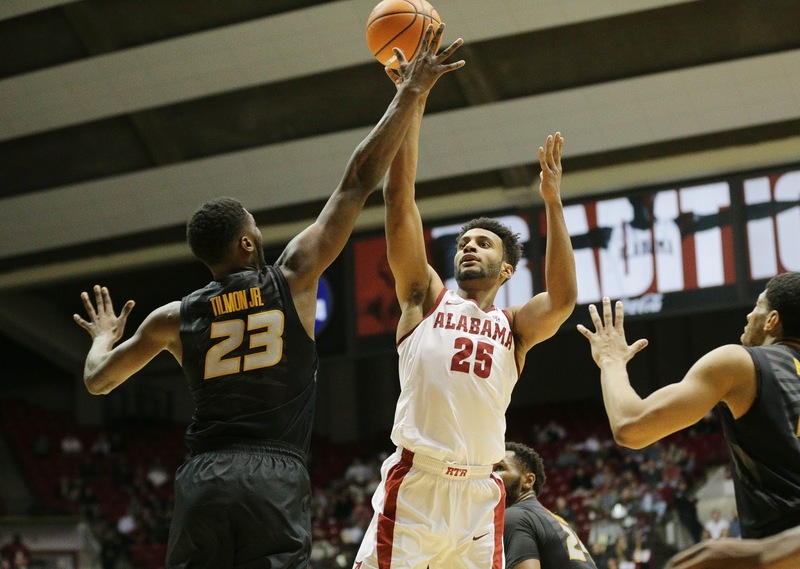 This is why Alabama's lack of urgency was so alarming vs Missouri because a few more nights like that in this conference, and this Bama team could find itself in a scenario that results in a Wednesday night appearance in the SEC tournament and a fanbase with dreams of what might have been. If that isn't hyperbolic enough for you, I'll go one further. The next nine games could determine the future of the Avery Johnson tenure. Everyone, including Avery, were pointing to year three. So far, it's been a mixed bag. If the year that everyone was pointing to is just more of the same for a program that has struggled to rise above mediocrity, is it fair to wonder if the years ahead will be any better? Speaking for myself, I embrace Avery's vision for the program. That vision has to include progress, though. Otherwise, it's just a dream. That may suggest that I sense doom and gloom for this team over the following six weeks. Not exactly. While this team has been a mess at times, I'm still a believer they find a way to win some more games and salvage this season. When we thought they were trending the wrong way previously, they've been able to do enough to get us back on board. Where this bounce back will take place though is impossible to predict based on the Jekyll & Hyde nature of this group. I thought this team was turning a corner after the Oklahoma game, and that turned out to be foolish on my part. This team will likely win a few games remaining we don't think they can, while also dropping a few more we think they should win. That's the team we've been blessed with. Buckle up, indeed. Players to Watch: After some promising games in recent weeks, Braxton Key took a major step back on Wednesday night. He took one shot attempt in the game, went 1-2 from the free throw line in 23 minutes of game time. At this point, it's time to ask is it more than health that is affecting Braxton? Is he unsure of his place on this team? There were times Wednesday when the flow of the game was begging Braxton to step up and get involved, only to see him pass up shot attempts, and show virtually no confidence in creating offense for himself. It was a clear reminder that while these guys may like each other as people, I'm not certain they understand how to fit with each other on a basketball court. I certainly hope we see more from Braxton on Saturday than what we got on Wednesday. He's so much better than what this season has shown. Chris Chiozza is the heart of this Gator team. Maybe not the most talented, but he makes everything work. Take him away, and this is a very average team in my opinion. Along with Auburn's Jared Harper, Chiozza is the best pure point guard in the league. He's averaging 12.7 ppg (40% from 3), 6.1 apg (an assist/turnover ratio of 3.5) and 1.8 spg. If Alabama can't make him uncomfortable, they have no shot at winning this game.